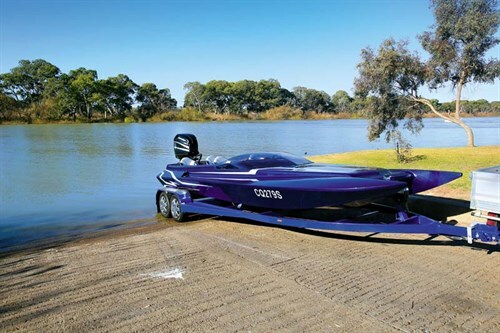 If there was ever a boat that looked like it could travel at warp speed, the Pro Custom Terminator is it. Paul Tuckey is a man with a big dream. 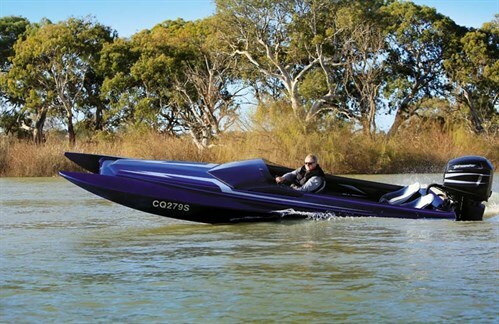 When I met him at his Adelaide factory he described how his love of fast cars and boats has driven him to produce many radical street machines and powerful skiboats over the last 15 years. For our review of his latest creation we set off for Murray Bridge, a drive of some 80km, and on the way Tuckey outlined his journey to producing his Terminator. On a trip to the States a few years back he described how the sight of a twin-hull speedboat left him gobsmacked and he knew he had to have one. Following negotiations to acquire a suitable mould he spent months of research, looking into dealing with exotic resins and glass before finally laying up the hull and deck for the first Terminator model which weighs in at 1100kg without the engine – it has been built strongly to cope with the pressures of high-speed travel. At the ramp I realised why we had come so far. What a magnificent section of the mighty Murray River it is, with wide flowing bends and long straight sections just perfect for water skiing and fast boats. Terminator is a low-slung beast with twin hulls protruding from the aerodynamic wing of the foredeck. These asymmetric hulls have seductive curves on the outside and follow a flat vertical line inside as they narrow to the transom. A third central sponson at the rear creates tunnels either side that converge for a ram effect at the back, increasing lift at speed. With a wing designed to keep the boat bow from lifting too high at speed and the ram air effect under the hull, Tuckey said the boat is designed to run on the rear section of the hull. The engine can be lifted up to 20cm higher on a Detwiler jacking plate for the 24in Trophy Plus surface-piercing propeller to achieve optimum drive through reduction of cavitation and drag. Narrow cockpit sides run well inboard of the wide sponsons and at the transom they join an integrated spoiler designed for downlift. 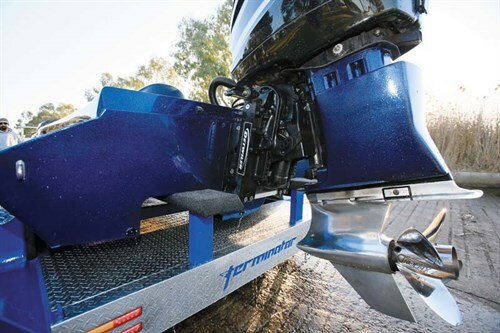 The Terminator can accommodate various engine and drive configurations with the initial version being fitted with a completely rebuilt Mercury Pro Max 300 outboard motor. At rest the boat sits low in the water and as it came past at speed for our photos it was hard to get an impression of its size. Overall it’s 23ft (7m) long but so low the engine towers over the boat and it was only into slower turns that it leaned in enough to get a perspective of the interior. 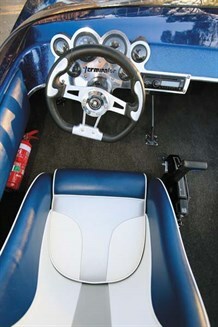 Jumping aboard, the simple layout of the outboard version means there is a relatively large flat space between the two front seats and a second pair at the rear. Blue, white and silver vinyl matches the hull’s exterior and a dark grey marine carpet covers the floor with cutouts to get to the twin 40lt underfloor tanks. All seats are comfortable buckets fitted flat to the floor so your legs are stretched out in front. It’s comfortable, especially for the driver who gets a foot-operated throttle and it means there is plenty of room for coil-boxes or ski equipment on the floor. As the hull is specified for up to six, extra seating can be ordered. It also means there is ample room for an inboard and a variety of drives – the next model out of the mould will accommodate a V8 and V-drive. As I settled into the left side helm seat I noted the neat panel of instruments set into the laser-cut aluminium dash and the racing style Autotecnica steering wheel. Large dials for the speedo and tacho are flanked by smaller gauges for the two fuel tanks, engine temperature and hour meter but surprisingly, nothing for engine trim or jacking plate height. There’s also a Clarion sound system, but most drivers will prefer to listen to the music the Mercury makes than the Freddy Mercury soundtrack. Tuckey described how he fashioned the curvaceous single-piece polycarbonate windscreen by first moulding its shape in clay then making a set of construction moulds. It suits the shape of the boat perfectly and did deflect some wind overhead, but I would have liked to have seen some supports which, although they may spoil the look a bit, will make the windscreen less vulnerable to damage if passengers lean on it. As the boat floated clear of its trailer the big Mercury outboard started with a loud blatt of throttle and settled into a high staccato crackle reminiscent of a top fuel dragster. Mercury Racing built these engines which reportedly pump out up to 320 real neddies from the 3lt fuel-injected V6. However, on the day of the boat review, we discovered that computer gremlins had limited the output, meaning we didn’t get to experience the outboard engine at full song. Some Pro Max engines don’t have a good reputation for idling and they aren’t kind to inexperienced operators. I had to have a couple of goes at getting it into gear without stalling it because the gearbox is quite clunky to engage and I didn’t want to mess it up with too many revs. Fearful of Tuckey’s disapproval I opened the throttle to drown out any jibes and we were away. As someone from the era of screaming 500cc two-stroke racing motorcycles, I love the sound of a high-performance two-stroke although it may not be the same for some of the residents along the riverbank. It is a bit noisy in a racy, likable way. Despite the engine not getting to full revs the performance was admirable, with runs of near 60kts (110kmh) the best for the day. Sitting so close to the water it feels fast but at the same time very safe and stable. As speed rises the ride gets softer as the air cushion takes effect. We cruised easily for a few miles down river and through sweeping bends at more than 45kts at around 4200rpm, but it is disappointing not to be able to report on how the boat went at the top of the rev range. Tuckey assured me the engine would be sorted and back to its full potential – when we later spoke, he thought the problem had been traced to a faulty temperature sensor. Acceleration from low to mid-range is sensational, so perhaps some grabrails for passengers might be in order, especially in turns where even at speed it hangs on exceptionally well – perhaps down to the 6in stainless steel fins that have been fitted amidships to each hull. Turn the wheel and plant your foot and it goes where it’s pointed with no pitching or wallowing. Experienced drivers looking for an exciting and eye-catching performance boat now have a viable alternative in the Terminator. 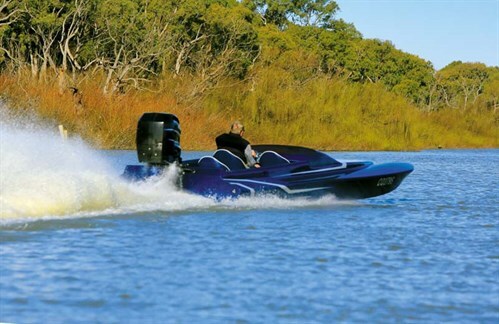 The first demonstrator Terminator is now available with the reconditioned Mercury for $69,000 and orders are being taken for boats with new engines, either inboard or outboard motor. That price includes all registration on an equally good-looking custom trailer.